Secretary Wilbur Ross praised Uzbekistan’s “democratic reforms,” but what he really meant was economic reforms. U.S. Secretary of Commerce Wilbur Ross praised Uzbekistan’s reform program in remarks given at the American-Uzbek Chamber of Commerce Business Forum held in Tashkent on October 23. “I want to applaud the successful political and democratic reforms that are underway in Uzbekistan, and to encourage your continued commitment to them,” he said early in his remarks, crediting such reforms with “improving the business and investment climate” in the country. Ross seems to have put the cart before the proverbial horse in highlighting political and democratic reforms as improving the business and investment climate in Uzbekistan. Few can deny that Uzbekistan has opened in a number of ways since the death of its first president, Islam Karimov, in 2016. But as Edward Lemon, the DMGS-Kennan Institute Fellow at the Daniel Morgan Graduate School and a Global Fellow at the Wilson Center, notes in an article out today at the World Politics Review, liberalization is not the main goal of Uzbekistan’s reform program under President Shavkat Mirziyoyev to date –economic modernization is. Beyond his opening statement about “successful political and democratic reforms,” Ross’ remarks focused on his remit: commerce, trade, and investment. These are areas where Uzbekistan and the Trump administration can and have found synergy. Ross, for example, underscored what has emerged as a key goal for Tashkent: membership in the World Trade Organization (WTO), which regulates international trade. 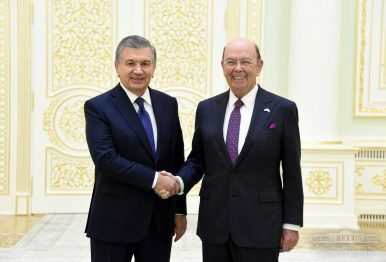 “We look forward to working with him [Mirziyoyev] and the Government of Uzbekistan at making your goals — such as membership in the WTO — come to fruition,” Ross said. In Central Asia, Kyrgyzstan, Tajikistan, and Kazakhstan are already WTO members, acceding to the organization in 1998, 2013, and 2015, respectively. When Kazakhstan acceded in 2015, its negotiation process (begun in 1996) had taken a record 19 years. Uzbekistan’s working party — a WTO body in which the prospective member and present members hash out the terms of accession — was formed in 1994 but has not met formally since 2005. At present, the WTO’s website lists no formal scheduled meetings for the working party in 2018. Nevertheless, Uzbek officials over the past year have repeated their intention to restart the process several times. In November 2017, while Mirziyoyev was on a state visit to South Korea the two sides signed a memorandum and “road map” for Seoul’s assistance in Uzbekistan’s accession to the WTO. The current chairperson of the WTO Working Party on the Accession of Uzbekistan is a South Korean diplomat, Ambassador Paik Ji-ah. Her predecessor as chairperson was also a South Korean diplomat, Seokyoung Choi. In March, Uzbek Minister of Foreign Trade Jamshid Khodzhaev noted that the process could take several years as Uzbekistan assess the impacts of members, strengthens its domestic industries and institutions, and works with the WTO to develop the necessary frameworks. Mirziyoyev made a historic visit to Washington in May, meeting with U.S. President Donald Trump at the White House. In “launching a new era of strategic partnership,” the U.S. side hailed Uzbekistan’s progress on the economic front, including its stated intention to host a meeting of the Central Asia Trade Forum and the United States-Central Asia Trade and Investment Framework Agreement (TIFA) Council in 2018. “President Trump pledged United States technical assistance as Uzbekistan undertakes a reform agenda to liberalize its trade regime in line with WTO agreements,” a joint statement after the visit read. Over the summer, additional support marshalled behind Tashkent. In June, the European Union announced its intention to allocate 5 million euros ($5.6 million) to Uzbekistan to support the accession process. Uzbekistan, which has been working to expand its cooperation with international financial institutions, is also looking to the World Bank Group’s International Finance Corporation (IFC) for assistance. The U.S.-Central Asia TIFA Council meeting mentioned above took place earlier this month in Tashkent followed a day later by a trade forum organized by the U.S. Agency for International Development and Uzbekistan. Ross’ visit closed out a busy month on the U.S.-Uzbekistan trade cooperation front. Under Karimov, Uzbekistan stagnated political and economically. Under Mirziyoyev, the economic space has been purposefully opened but the political space remains unquestionably undeveloped. Later in his remarks, Ross declared, “Economic freedom does more for a country than any other activity.” The subtext perhaps being that economic freedom is freedom, too, and the kind of freedom the Trump administration can get behind. Highlighting the humble garage and dormroom beginnings of Apple, Google, Amazon, and Facebook, Ross presented what the United States has to offer Uzbekistan: an economic model worth emulating. He may have started with window-dressing comments on political and democratic reforms, but the core of Ross’ remarks was a pitch to Uzbekistan that doing business with the United States is a good deal. And there’s nothing the Trump administration loves more than a deal.